Use these naming conventions. Rename ONLY the yellow.  1_statement.txt = write a statement in this document. This should be fully realized, smart and insightful - a snapshot of your conceptual agenda. Also it could be creative, rhetorical or metaphorical. Write like you have an audience. Please do not write something that explains to the instructor what you did. Likewise don't just write a play-by-play of what happens. Write expressively about your ideas. Utilize the adjective. 50-350 words. The .txt files MUST be properly titled and uploaded to the course web page for each project. 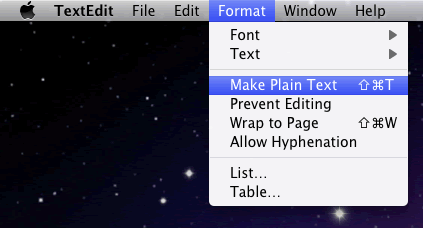 In order to make a .txt file in TextEdit you must first make the TextEdit document "Plain Text" (see image above). Please note that all rich text will be removed. You should use html tags to insert paragraph breaks "<br /><br />". Also, apostrophes need to be changed to "&#39;" - you can use a find/replace function to fix these (⌘F). Other than paragraph breaks and apostrophies you shouldn't need html tags. Cyriak - an animator from Brighton, UK. Adam Pierce - a stop motion animator from NYC. PES - a stop motion animator from Portland, Oregon. DES 682 - Interactive Design II, This course focuses on the advanced planning, conceptualizing, designing and building of an interactive project. Students review contemporary designers’ solutions to complex media projects, and using this knowledge as a foundation, develop their own innovative solutions. The emphasis is on developing an individualized approach to new media. Examples of potential projects include interfaces for mobile devices, electronic books, and interactive branding. This course will be conducted primarily as a vehicle toward individual design research and application. The secondary goal of this course it to critically examine the purposes and results of the research and to help classmates work through these design problems conceptually and technically through critique and class interaction. There will be 3 main projects in this course. Likewise a writing component in this course will manifest itself in three ways; as a statement for each project, as a review of a fellow student's work on critique days, and as critical opinion to research topics. Along with completing assignments, class members are encouraged to communicate with each other outside of class via electronic means, email, IM, FB... This can include, but not be exclusive to problems, solutions, information, etc. The benefits of developing a network within your area of design cannot be over done. Each of the projects will conclude with a discussion and viewing of the finished work. Students are expected to present their completed projects to the whole class. Students are expected to vocally participate in the discussions of each project presented. It is understood in the critique environment that the author of the work listen to other's interpretation's and feedback prior to explaining their intentions. This is to promote an unguided and more accurate interpretation from your peers and encourage a heightened awareness of intentionality from the author. Each Critique will follow a specific formula. A student who is having their work critiqued must post their work the DES682 course website by 6pm the evening before the critique. An assigned reviewer student will write a review of the work, describing what they see, their interpretation, how they believe the work exists contextually, and finally if they believe the work is successful and why. There will be a system set up so that can be communication between students. Some projects may require the purchase of additional supplies as needed on an individual basis. This is a studio course and WILL require work beyond the scheduled class period. Computer lab hours will be posted. A (4.00): Outstanding work. Outstanding achievement relative to the level necessary to meet course requirements. Performance was of the highest level. Excellence while meeting course objectives was sustained throughout the course. Not only was the student’s performance clearly and significantly above satisfactory, it was also of an independent and creative nature. A- (3.70): Excellent work. Excellent achievement relative to the level necessary to meet course requirements. Performance was clearly and significantly above satisfactory, and was creative and independent. B+ (3.30): Very good work. Achievement above the level necessary to meet course requirements. Performance was very good, although not of the highest level. Performance was clearly and significantly above satisfactory fulfillment of course requirements. B (3.00): Satisfactory work. Achievement that meets the course requirements. Performance was adequate, although marginal in quality. B- (2.70): Good work. Achievement at a level just above that necessary to meet course requirements. Performance was notable. C (2.00): Minimum passing work. Achievement barely worthy of credit. Student demonstrated unsatisfactory achievement in meeting course objectives, yet fulfilled a sufficient enough portion of the course objectives that repeating the course is not necessary unless required by the academic unit. F (0.00): Failed – no credit. A failure to meet course requirements. The work of course objectives were either: 1) completed but not at a level of achievement that is worthy of credit, or 2) have not been completed and there was no agreement between the instructor and the student that the student would be awarded an “I” (incomplete). Failure to meet assignment and project deadlines will result in lowered grades. For each class day the assignment is overdue, its grade will be lowered one full letter. Documentation of your progress MUST be reflected in your submission pages or it will not count as finished! Special considerations will NOT be given to students on the basis of technical difficulties, if alternative solutions were not actively pursued. Students are expected to use their time and energies wisely. Instructors have the right to request documentation verifying the basis of any absences resulting from the above factors. Do not ask the instructor if it is all right to miss a class for any other reason. An excused absence does not excuse the student from making up class time missed in a timely manner. Attendance will be taken daily and arriving to Lecture/Lab component 30 minutes late and/or leaving more that 30 minutes early will be recorded and counts as one-half of an unexcused absence. Signing in for any other student will result in a failing grade. Learn the basics of interactive animation and UX. Learning to use CSS as UX tool rather than just for style. Create 6 UI componets with a unifying theme. 4 of these must be interactive (for instance a spinner is not interactive but a button with a hover state is interactive. The 6 elements should be new techniques to you. Also the writing element for this project does not need to be creative like they will in future projects. Create a div tag thats 800px by 500px and confine all the elements of the animation within. This will be posted and made live with in your student upload folder and can be seen in whole on the DES 682 student website. Some artists and designers create work using a generative working process. Their work is the result of one or many processes and is focused on developing a conceptual framework by means of the working process. This working methodology can produce a broad scope of work from societal statements to minimal contemplative objects of beauty. The idea behind of this kind of process is to indirectly create the final product or to manipulate imagery and elements systematically. Manipulate your content until you have reached a stylistic approach. The process mode you choose can be as simple or complex as you please. The final project should be fully interactive. In alphabetical order, Eric is an animator, artist, designer, developer and musician. He is a graduate of Cranbrook Academy of Art, MFA 2007, and Missouri State University, BFA 2005. Originally from Kansas City, Eric has worked for the past three years as a freelance motion graphics designer and interactive developer in New York. His client list includes JPMorgan, Macys.com, The Rockefeller Group, Cushman & Wakefield and Opie & Anthony.